We were approached by entrepreneur and inventor, Jeff Greiwe to create the Freesway Balance Trainer for his company, BalanceMetrics. We were able to provide both the design and branding tools necessary for Jeff to turn his idea into a product that shipped and could be sold in the therapeutic market. In fact it held such a presence in the market, that Jeff sold the Freesway product to a major therapeutic equipment manufacturer and is now working on his next great ideas. The case study below addresses the Identity & Marketing work around the BalanceMetrics Brand — for the case study on our Industrial Design work on the Freesway Balance Trainer, click here. 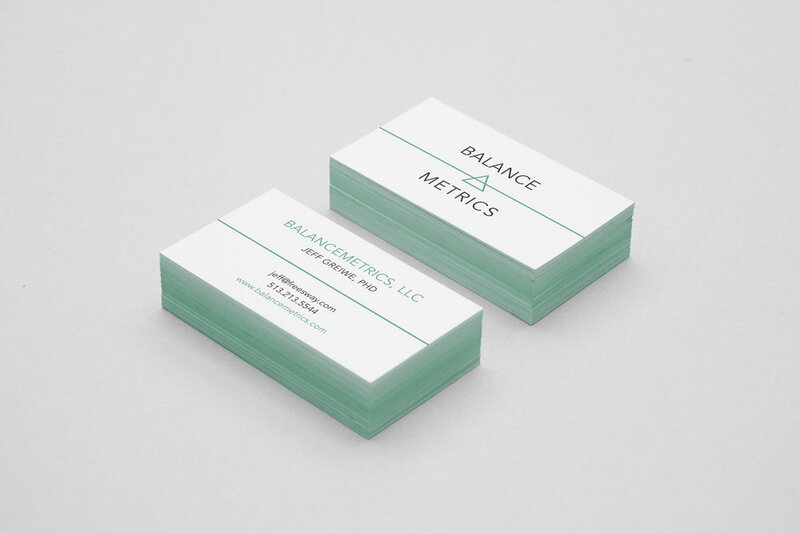 Building a brand for BalanceMetrics began from a discussion with its founder and a deep dive into its product's users. The Freesway Balance Trainer was designed and developed for users who had already experienced, or were afraid of experiencing a fall. The buyers, typically rehabilitation or geriatric centers, needed a sense of calm and stability from this brand — and most importantly, users needed a feeling of trust that this piece of unfamiliar machinery would keep them from falling. From this insight we moved towards creating a brand who's basis was in presenting peaceful, calm aesthetics associated with the device. Many of the elderly users heavily referenced a return to nature and healthy outdoor activities as the desired end-goal of their balance training, and this also drove our decisions. Before heading into design of the main brand identity, we created an "onliness statement" a' la Marty Neumeier's proven brand book, Zag. after an injury or (preventatively) before a fall. Starting with the core emotional content of the brand and an understanding of what statement it wanted to make, we began the brand identity asset creation process with typography and logoforms. The initial branding process begins in sketchbook doodles and discussions within our team, the formal results of that process are below. Typography for Balancemetrics needed to be clean, clear and approachable — leading us to humanist and hypernormal sans serifs like DIN, Helvetica, Neutra, and Avenir — the latter of which was the best fit in both Display and Body text. Avenir was also imminently readable in even lighter weights, which was quite important considering the main user may have less than perfect eyesight. Logoforms for Balancemetrics centered around primary and minimal forms. The core intent of the brand and its product is to create more balance. Having a logoform that was not balanced in either symmetry or geometry seemed counterintuitive. Eventually the team and client centered around a few abstract shape ideas — the square being the base of the machine, the triangle being the human in a balanced stance, the line being the arms (interaction point) of the machine, and the circle being the motion of the dumbbells of the device (which when balanced, stay in the center of the holders). As you can see on the second sheet below, the chosen logoform was that of the human in a balanced stance with the machine arms bisecting the form. This form, with its sturdy base and pyramidal top also took on the meanings of focus and improvement as someone used the machine more to improve their balance. Once a logoform was chosen, the typography and logoform was combined in a variety of ways to try it out and experiment. Some of the experiments in the selected approach eventually worked its way into formal usage. Finally a breadth of color palettes, largely nature inspired, were narrowed down to a chosen handful — eventually resulting in a seafoam-like palette being the best approach. While still containing placid greens of nature, the chosen palette had a blueish tint that spoke of the ocean and was unique in the exercise equipment world. As the pieces were brought together, it really began to feel like a perfect fit from both our perspective and the client's as well. We now had an approachable identity that spoke to the calm, balanced nature of the product. The next step utilized these core brand assets into functional marketing touchpoints for use in customer-facing and sales scenarios. The Balancemetrics Website was created to fulfill a handful of direct needs related to sales of the Freesway device. Namely, communication of the function and price of the device as well as communication of the variety of exercises available to users once they have the machine. Finally, the website offered an easy and direct way to communicate with the company and purchase the machine if they are ready to do so. After a series of sales opportunities, the client was ready to take their product to the next level by heading to a trade show to present the product to a broader audience of consumers and resellers. To do so, we needed to construct a set of clear and direct booth graphics that brought people in to try out the machine firsthand. Once at the booth and in discussion with BalanceMetrics, they could receive a takeaway flyer that gave them all the info needed to make a decision on the purchase. As the news of the Freesway Balance Trainer made its way through the market, the client requested that we create a presentation template for use in the meetings he was having with potential buyers. We cerated a clean, easy to read and use template, implementing a series of master slides and typographic choices that could easily adapt to the clients needs, depending on the presentation. Additionally, we were asked to create a series of vinyl stickers to be used as warning labels and branding on the device. Accompanying every Freesway Balance Trainer is an instruction sheet showing how to do the majority of exercises with the machine. This sheet would usually be printed in a large format and mounted near the machines. While quite information dense, the organization and hierarchy decisions were informed by feedback from the panel of choice geriatric users who requested specific desires on readability for steps of the exercise. This resulted in some atypical design choices in typography that worked better for the user. 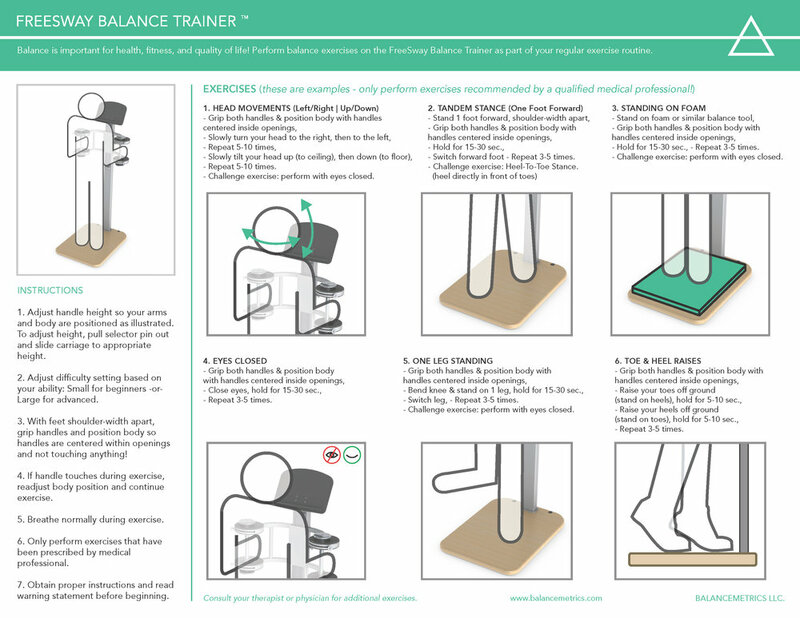 Direct mail flyers or "sell sheets" played a large role in getting the word out about the Freesway Balance Trainer. Much of the pitch of the machine required a fair amount of education — on both the need for balance training, and the exercises themselves. We attempted to communicate this dense amount of information efficiently, keeping the output to the front and back of one page, while still being enticing and drawing users to purchase. Working with the client and a third party videographer, we created a series of advertisement and instructional videos surrounding the Freesway and its usage. These videos included branded bumpers, voiceovers, and direct footage of the device in use. A total of four in all, these videos helped drive traffic to potential purchases, as well as helped inform the myriad of customers on how to best use their purchase.